Deciphering the molecular signalling networks that regulate skeletal muscle growth, atrophy and regeneration represents a key goal in musculoskeletal research - not least because of the therapeutic potential these pathways may hold in the treatment of diseases such as muscular dystrophy, sarcopenia and cachexia. My research interests lye in identifying and understanding such pathways and examining their function in relevant physiological and pathophysiological settings in vivo. Skeletal muscle is an excellent system to model tissue regeneration, thanks to a potent population of resident adult stem cells (satellite cells). Understanding the cell autonomous regulation of satellite cell function and heterogeneity (orchestrated by signalling pathways, chromatin modification or miRNAs) as well as the interactions between these cells, their niche and other muscle-resident progenitor populations is of particular interest. As is understanding the extent to which muscle stem cells contribute to skeletal muscle homeostasis in normal physiological settings outside of disease and models of gross injury (e.g. cardiotoxin). Following completion of undergraduate studies at The University of Birmingham, Robert moved to The University of Aberdeen in 2007 to begin his masters studies in Physiology. 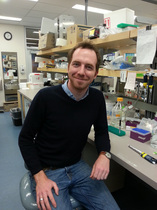 Robert's MSc research focused on human population genetics, where he investigated the association between the single nucleotide polymorphism ACTN3 R577X, skeletal muscle function and falls in two large cohorts of elderly women (Judson et al., 2010). In 2008 Robert was awarded a prestigious Oliver Bird Rheumatism Program studentship and completed his PhD studies at the same institute in the Musculoskeletal Research Group under the supervision of Dr Henning Wackerhage and Prof Cosimo de Bari. Here, Robert investigated Hippo signalling and the function of Yes-Associated Protein (Yap) in skeletal muscle, myogenesis and satellite cells where he gained considerable experience and expertise with variety of in vitro (Watt & Judson et al., 2010), ex vivo (Judson et al., 2012) and in vivo (Judson et al., 2013, Owen et al., 2012) models of mammalian tissue growth, differentiation, regeneration and disease. This project involved several collaborative trips to Prof Pete Zammit's lab (King's College London) where Robert became familiar with working with single myofibre cultures and retroviral gene delivery methods ex vivo. Outside of science Robert is an avid sportsman participating in a variety of outdoor activities such as running, skiing, soccer, climbing and hiking. Robert N Judson, Stuart R Gray, Claire Walker, Andrew Carroll, Cecile Itzstein, Arimantas Lionikas, Peter S Zammit, Cosimo De Bari and Henning Wackerhage (2013) Constitutive expression of Yes-associated protein (Yap) in adult skeletal muscle fibres induces muscle atrophy and dystrophy.. PLoS One. 2012;7(2):e32700. Epub 2012 Feb 28. Carl Owen, Alicja J Czopek, Abdelali Agouni, Louise Grant, Robert Judson, Olga Göransson, Andy Welch, Kendra K. Bence, Barbara B. Kahn, Benjamin G. Neel, Nimesh Mody, Mirela Delibegovic. (2012) Adipocyte-specific protein tyrosine phosphatase 1B deletion increases lipogenesis, adipocyte cell size and is a minor regulator of glucose homeostasis. PLoS One. 2012;7(2):e32700. Epub 2012 Feb 28. Watt, K., Judson, R.N., Medlow, P., Reid, K., Kurth, T., Burniston, J., Ratkevicius, A., De Bari, C. and Wackerhage, H. (2010) Yap is a novel regulator of C2C12 myogenesis. Biochem Biophys Res Commun, 393, 619-624.